Rationalist Judaism: But What Kind Of Ram? We know that the best way to fulfill the mitzvah of shofar is with the horn of a ram. This is because one of the reasons for the shofar is to remind us of Avraham's binding of Yitzchak, and the ram that he offered in its place. But has anyone ever stopped to think about what kind of ram it was? It occurred to me that it wouldn't have been an ordinary domestic sheep, since Avraham was out in the wilderness. Furthermore, as my friend Rabbi David Bar-Cohn pointed out, Avraham would presumably not have stolen someone's sheep! Thus, it would have been a wild variety of sheep - possibly the aoudad, but more likely the mouflon. Mouflon shofars are not normally available; the one that is on display at The Biblical Museum of Natural History may be the only one in the world. It is spectacularly beautiful! 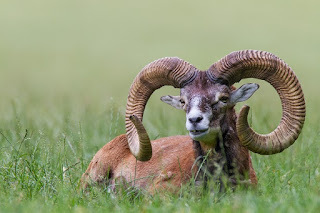 There are no longer any wild mouflon in the Middle East; contemplating Avraham's ram reminds us that many wild animals which used to live in the Land of Israel no longer do so. 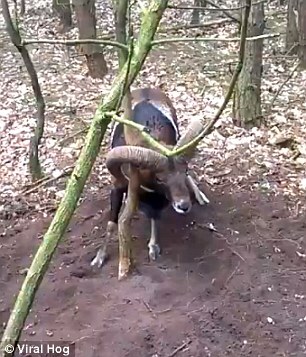 A mouflon caught by its horns in a thicket. See this link. I've added this tidbit to my monograph Exotic Shofars: Halachic Considerations, which has also been updated with new photos, and is freely available for download at this link. There is a Mouflon ram at a park zoo here in Toronto. Thus, it would have been a wild variety of sheep - possibly the aoudad, but more likely the mouflon. Just curious: do wild sheep actually sometimes get trapped by their horns tangled in a thicket or is that part of the story an aspect of Providence. There are YouTube videos of animals getting caught by their horns. what makes you think it was most likely the mouflon? (I noticed in your monograph you are much more assertive - you write "...Instead it was a wild sheep, also known as the mouflon". Why are mouflon shofars rare? There seem to be a lot of Mouflon horns for sale on ebay. "There are no longer any wild mouflon in the Middle East"
perhaps this is pshat in the pasuk, "Ayal Acher" (where was the first Ayal?). most read this to imply that Yitzchak was like an ayal, but this makes much more sense, a different kind of Ayal (and also, based on your pics, it makes sense to get tangled more than a normal rams horns). Shkoyach!! the text actually reads "Akhar" = "back, behind." This should probably be corrected to "ekhad."